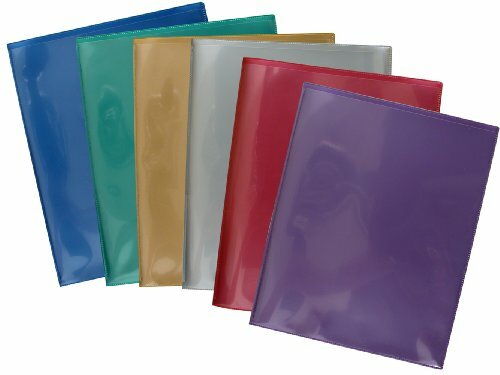 This pack contains six folders, one each of metallic blue, metallic green, metallic maroon, metallic purple, silver, and gold. Outside Pockets: 8 1/2" x 11" crystal clear pockets on the front & back covers. Inside Pockets: 4 1/2" Crystal clear pockets on both sides. Business card slits on the left pocket for your card. Available on Amazon in different quantities and colors! --- --- Also see on Amazon a wide selection of StoreSMART's LX Variety Packs including: R900ALL16 (1 folder of each 16 colors), as well as School Homework folders in English (R900PCP6ENG) and English/Spanish (R900PCP6SPAN). --- --- LX Polypropylene Archival Plastic Folders withstand the test of time! For Students: They last more than one school year. For Teachers: Keep your classes organized. Holds up to 50 papers per side without ripping on the fold. For Offices & Home: Color-code your projects! For Proposals & Training Programs: Insert title page in the front and information inside. For Libraries & Archivists: Constructed of 100% super polypropylene archival material. Ideal for classroom, medical, and business environments. Perfect for color-coded classification. Vivid colors help you stay organized. --- --- StoreSMART offers on Amazon many sizes of self-adhesive pockets, non-adhesive pockets and job ticket holders. Use for business cards, CDs, in binders and more. These pockets are ideal for adding important personalized information to your reports, documents, presentations and proposals. If you have any questions about this product by StoreSMART®, contact us by completing and submitting the form below. If you are looking for a specif part number, please include it with your message.